Nova and Phalanx-Select Gamora awaken to find themselves in each other's arms! After separating, Gamora attempts to stab Rich Rider with a knife and receives a kick to the stomach in return! The warrior woman begins shooting bursts of energy at the Earthman who blocks them with a grav-shield. Nova returns the attack with a collimated beam! As the two continue fighting, Nova attempts to reason with Gamora by getting her to remember the last thing that happened to them. She attempts to kill Rich again until he reminds her that he has a phased pulse ready to blast her head off. Gamora recalls that she and Drax had caught up to Nova in the extradimensional transit created by the scientists of Knowhere. After they started fighting, she doesn't remember anything before waking up with the young hero. The two ex-lovers begin walking through the strange landscape they're trapped in. At the same time, the WorldMind continues to attempt finding information on where they are stranded. However, it is limited in its scanning capabilities. This is due to the continuing battle being waged inside of Richard Rider between the WorldMind and the Phalanx's techno-virus. Nova notices they are surrounded by wrecked starships and Gamora notes that the place smells of death. Rich also realizes that it appears they were interrupted in their journey to Kvch. Suddenly, they hear a loud noise similar to the one which woke them earlier. The two continue exploring and come across an alien being that the WorldMind recognizes as a Voidnaut. With his universal translator on, Nova learns that the Voidnaut is injured and has been stranded for some time. Before Rich can rescue the alien traveler, the three of them are attacked by a swarm of slithering creatures! The hero from Earth immediately begins blasting the attackers in an attempt to save the injured Voidnaut but he's too late to free him. Nova grabs Gamora and they fly off to a safer area. Temporarily safe, Richard Rider takes a moment to regain his focus. The techno-virus is raging through his system and is gaining strength. Gamora senses that he is weakening and begins trying to convince him to give in to the virus. Nova tells her that he will never give into the Phalanx again. The two engage in a heated argument about being a Phalanx Select and Rich reminds her that she killed Ko-Rel in cold blood. Gamora tries to tell Nova that he had reached his powerful potential while he was a Select. The Earthman reminds her that he was a monster and she is still one until she's no longer one of the Phalanx. The two former lovers recall their relationship during the Annihilation War. Gamora says they can have a relationship again if he becomes a Select. Nova reveals to her why he left her during the war. Rich had left her in charge of interrogating a group of Kree collaborators. Instead of learning information, the female fighter decided to kill them. That was the moment Richard Rider decided he could no longer love her and left. Suddenly, they are attacked by the slithering creatures! Nova and Gamora put aside their differences and begin fighting the alien attackers. The WorldMind alerts Richard that they must stop fighting or the techno-virus will be released. Rich tells the artificial intelligence that he has to rescue Gamora from the overwhelming numbers. The WorldMind tells him to let her die as she is a sworn enemy. Nova saves Gamora and tells the WorldMind that abandoning someone in danger isn't his style. Having escaped the creatures, the two fighters come across an energy gateway. Nova flies through it in order to avoid the pursuing aliens. They land in another chamber and Nova collapses due to his internal battle against the strengthening techno-virus. Once more, Gamora tells Rich to give in before it kills him. Richard Rider refuses and Gamora cannot understand why he is so stubborn. She also reveals that she is jealous of his moral strength and being around him made her feel guilty about who she was. It's the reason she embraces being a Phalanx Select since she no longer feels guilt or any other emotion. Before they can continue their talk, the slithering creatures return! The WorldMind realizes where they are and informs Nova of his conclusions. Nova and Gamora are trapped inside of a Vore. The Vore is a natural predator that hunts between dimensions. The predator had captured the two enemies as food for its offspring! They also discover that the Vore is about to give birth! Nova immediately forms an energy shield around himself and Gamora as the young bursts out into normal space! 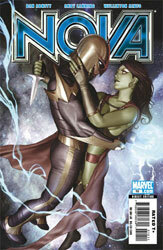 Now that they are safe in the normal universe, Gamora embraces Nova while pulling out a knife behind his back! Suddenly, there's a burst of energy and Gamora collapses from Nova's blast. Gamora had previously told him not to trust her and he didn't. The hero takes her limp form and tosses it to Drax who had been trying to fight the Vore from the outside. Nova opens a stargate and resumes his course to Kvch. The WorldMind is very concerned about Rich's health as the Phalanx virus is raging throughout his body. The artificial sentience reveals that they have only two hours before the virus takes control of Richard Rider's body...or kills him!